Conor Chaplin is being lined up for a move to Coventry – and Pompey fans have had their say on the news. The News reported this morning that the forward was being targeted by the Sky Blues as a replacement for Marc McNulty, who is expected to join Championship Reading. 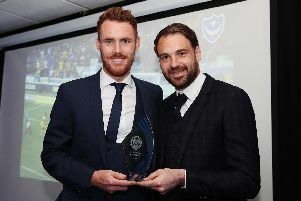 And the subject has seen readers head to our Facebook page Portsmouth FC – The News and portsmouth.co.uk to express their views on a potential move away for the Worthing-born player. Read Jordan Cross’ Chaplin verdict here. We can't sell him, he's going to be a class player one day. Needs the experience at league level, not Havant. Loan him out to Coventry, a league one club and he will get game time and prove to Kenny Jackett that he can take Pitman’s place when he looks to move on in a year or so. Done well coming off the bench in League Two but done nothing when he started. He also didn't look quite up to League One standard last year. Both Kenny and Cook didn't seem to want to start him, must be for a reason. Better to get some money for him now as he won't play much if he stays and won't sign a new deal if he doesn't play. As much as I like the lad he just isn't good enough for us and how often has he played 90 minutes? The lad has serious stamina issues and when he's started he is usually subbed. He just hasn't improved as we expected and we need a proven 90 minute goalscorer. Good luck Conor but Coventry ……. hmmmmm. Let him go! No point in being a benchwarmer for another year! Worst decision Kenny will ever make. He should be playing him more not dropping him! Had to happen at some stage. Hard to say and probably accept but his game time at PFC is going to be limited. We will come to regret this. No brainier for the lad really if u think about it. Probable 1st team football for him, we’ll get some money. Isn’t a regular, when he has had starts, he hasn’t performed well enough to stay a regular. Might come back to bite us if he does leave though! Think it would be a good move for him . I’m sure he’ll be sad to leave Pompey, but if he’s got a chance to play then he’s gotta take it . Think there’s a reason why both Cook & KJ don’t favour him. It's a tough one but ultimately he hasn't performed constantly when given a start. Yes there has been moments of magic but if he had been that good then he would have played more? As long as Kenny has a replacement in mind plus clauses put in then it's probably best for all parties if he goes. I'm not sure he'll be happy staying here being a super-sub? I think he has been given a chance by Cook and KJ, That’s not to say he won't come good eventually. A loan would have been preferable to see how he got on, if he scored consistently then great. If Coventry are trying to secure £1 million for Sparky, I can’t see us getting too much for Chaplin (500k - 750k probably). Hopefully we’ll stick in some decent sell on clauses.